A friend of mine recently had a split tooth repaired at the dentist and asked me for the Chinese reflexology point to help her heal the nerve in her bicuspid. As I always caution, Chinese reflexology does not replace proper medical, or in this case, dental care. However, it can play a leading role in helping the body get back in energetic balance to heal itself faster. So, to my dear friend, I hope your tooth (nerve) heals quickly and I hope this reflexology point helps take the edge off the pain as you recover. The reflexology area is shaped like a thin strip that goes across the top of the toe and there are two strips on each toe. 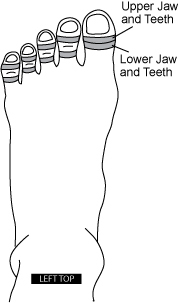 The distal (top) strip is for the upper jaw and teeth. The proximal (bottom) strip is for the lower jaw and teeth. Since the right lower bicuspid is involved, the best area to rub would be the strip located on the second toe (next to the big toe) of the left foot, just below the knuckle. Feel around the reflexology area for extreme sensitivity. If you can’t feel anything, try the big toe, towards the left edge or the third toe, towards the right edge. Use your thumb to press and rub across the strip in a side-to-side motion. Get ready for a big OUCH! This method allows you to feel with greater precision exactly where it hurts the most. Once you have found this spot, keep rubbing it for about a minute, several times throughout the day. Continue for as long as you feel is necessary to help with your recovery. Discontinue if you begin to curse me as your friend :).